Vesper Sparrow Film site is now live! We have some exciting updates to share with you all here at Klamath Bird Observatory. The Oregon Vesper Sparrow research we have been working so hard on is being turned into a short-film documentary! Local photographer and videographer Daniel Thiede has spent countless hours in the field with us this past year to help document our research efforts. We are thrilled to announce the Vesper Sparrow Film site is now live! Click on the link below to view the trailer for the film and to donate to the Oregon Vesper Sparrow research and documentary. We have a lot of work ahead of us, and need your support! CLICK HERE to visit the Vesper Sparrow Film website. The Oregon Vesper Sparrow Pooecetes gramineus affinis can be found west of the Cascade Mountains. This subspecies has been petitioned for listing under the Endangered Species Act because of its small population size and declining trend. Breeding Bird Surveys indicate a statistically significant declining population trend of ~5% per year. The 2010 estimated range-wide population size was <3,000 birds, and more recent information suggests that number is closer to 2,000 birds. Understanding the causes of population decline is critical to informing conservation action. A group of collaborators are contributing to a three year range-wide study to assess limiting factors. The study will assess whether birds are successfully producing young, surviving the winter, and dispersing to nearby habitat to identify where within the annual life cycle conservation actions are needed. 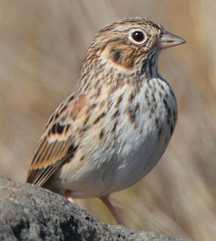 With the Oregon Vesper Sparrow currently under a 12-month review to determine whether listing under the Endangered Species Act is warranted, it is critical to understand subspecies variation for this species. 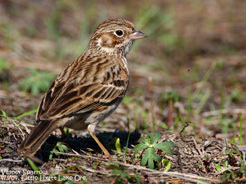 Improved understanding of variation in morphology and vocalizations of the Oregon Vesper Sparrow subspecies, compared with other Vesper Sparrow subspecies, may have major conservation implications. 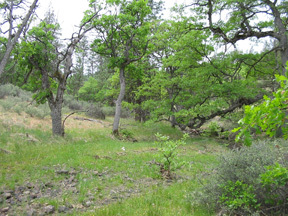 KBO, along with project partners in the Puget Lowlands in Washington (Center for Natural Lands Management), as well as the Willamette Valley (American Bird Conservancy), and a graduate student from Southern Oregon University, have been in the field collecting data to help us understand what makes this subspecies unique. Next year our efforts will continue, and our work on subspecies variation will be expanded to include the Great Basin Vesper Sparrow populations P.g. confinis in eastern Oregon. Please continue to tune in to KBO and the Vesper Sparrow Film websites to receive updates on this important work.